Many of us remember the famous scene from Indiana Jones and the Last Crusade, where Harrison Ford and Sean Connery race through a steep, narrow canyon on horses, and burst through a sudden opening, discovering the hidden city. I’ll never forget their first glimpse of Petra, the stone city carved deeply into the side of the red cliff. At the time, I thought it was just make believe, a brilliant part of the cinematography used to create the movie, but I was wrong. When I realized that this unusual destination, Petra, the Capital of the Nabataean Arabs, really existed, it was added to my list of places to visit. 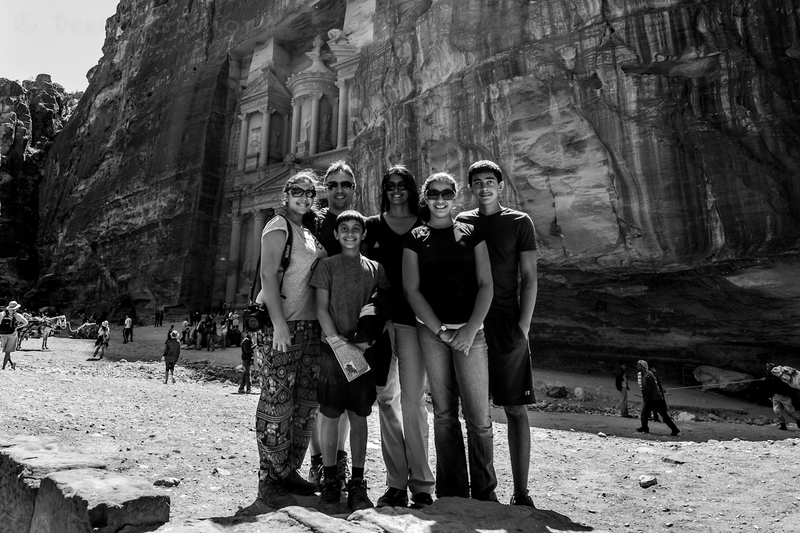 We chose to visit Petra on our own, which was a great choice for us, as it was relatively easy, with only two main challenges. The first was the distance from our hotel, which was on the Dead Sea. It took us quite a while to arrive, but it was doable in a day. While staying closer is definitely an option, we opted to do a day trip and skip the packing and transporting of four kids and six suitcases. We’ve found extended stays work much better than packing and unpacking, at least for us. The second challenge? 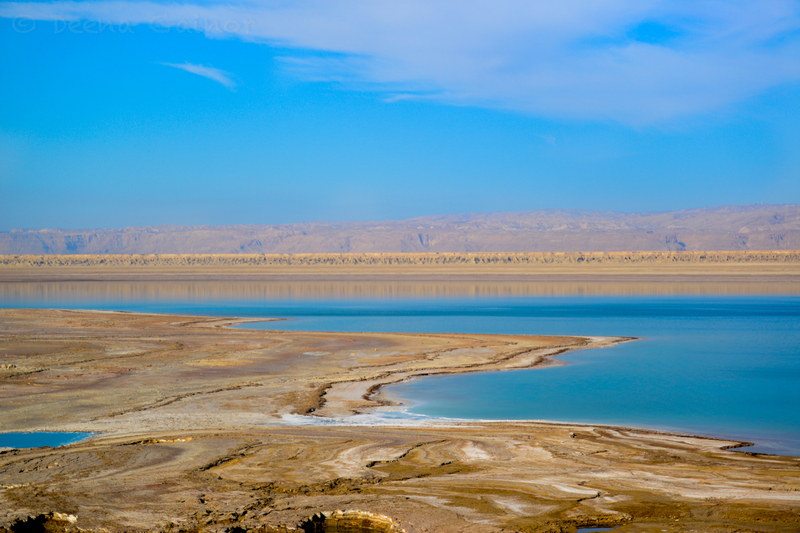 There are almost NO signs along the way, if you go along the Dead Sea. Had we not had my phone to follow along on Maps, we could have gotten easily lost. So…provided you keep those two things in mind, it really is quite easy. We decided to hire a guide, who provided a wealth of information we would not have gotten by walking through on our own. It was a great decision and I would highly recommend it. The guide we toured with was friendly, professional, and very knowledgeable. He made the site come alive for us. Hiring a guide also included a short horseback ride. Although we all love horseback riding, we were hesitant about riding in this setting, as we’ve become increasingly aware of how animals are sometimes used and abused to make a buck. 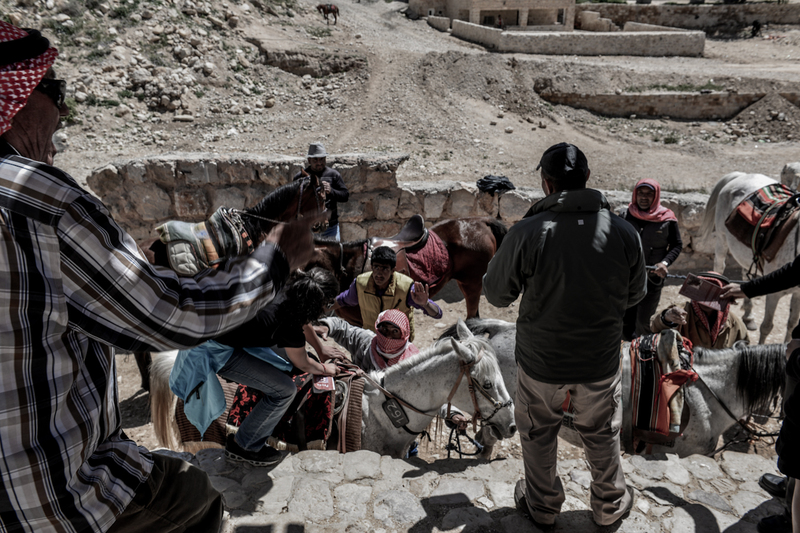 Our guide reassured us that the horses were well cared for, so we agreed; however, we were not happy with how rude and forceful the horse men were. In fact, a verbal fight broke out as we approached the horses. The workers were yelling over who was next to get our business. The shot below is terrible, as I didn’t want to be too obvious, but you can see the one man shouting and pointing his finger at the others. Poor Kathryn was stuck in the middle (look just under the man’s outstretched arm)! It was rather ugly and we almost walked away, but before we realized it, they had the younger kids on horses and ready to go, so we went with it. No one besides us seemed phased by this interaction, so the conflict must be quite common. For that matter, the camels and donkeys also seemed to be pushed really hard. It was hard to watch and if we had to do it again, we would forgo the horseback rides. 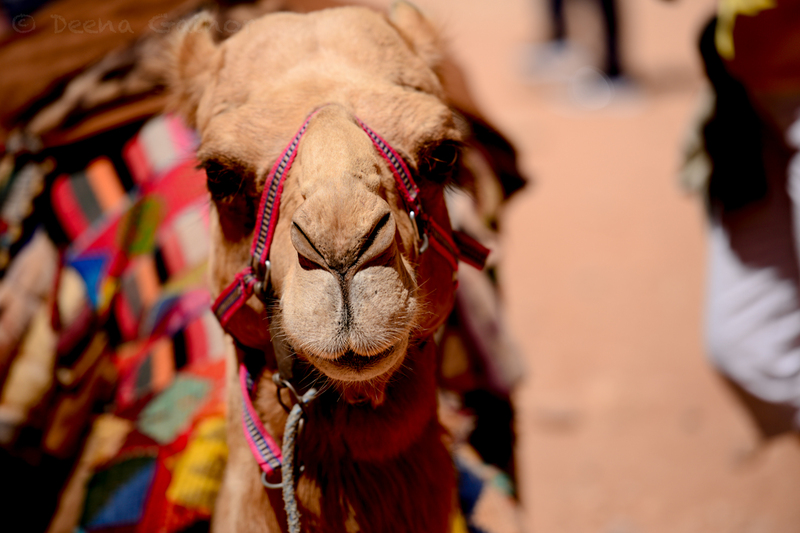 We chose not to do any donkey or camel rides, but trust me, they will hound you and you will be tempted if it’s hot and you’re tired! Sorry but these guys were just adorable. The camel was so curious and mild-mannered, I couldn’t help taking a few shots. This donkey was exhausted, poor guy. I wanted to take him home with me. Despite all of that, we did enjoy our day in Petra. Here are a few more shots from the day. 1. Bring a lot of water and keep yourself hydrated. 2. Wear really good walking shoes. 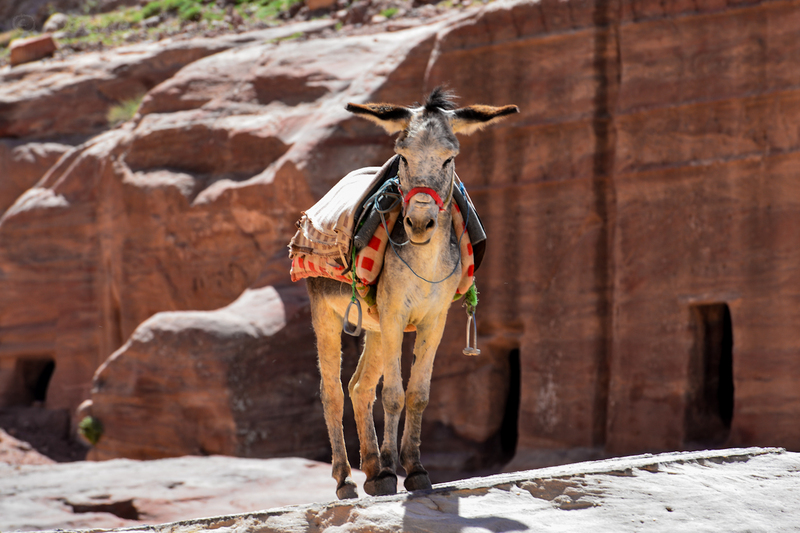 If you forgo the animal transfers, you’ll end up walking quite a distance in and out of Petra. 3. Bring a hat, sunglasses, and sunscreen as well. There is limited to no shade in places. 4. Either visit very early or later in the day when the sun is not so hot and the crowds are less. 5. Pack a lunch and snacks. Though there are small food stalls/restaurants there, you’ll be happy to have your own food ready when you need it. 6. 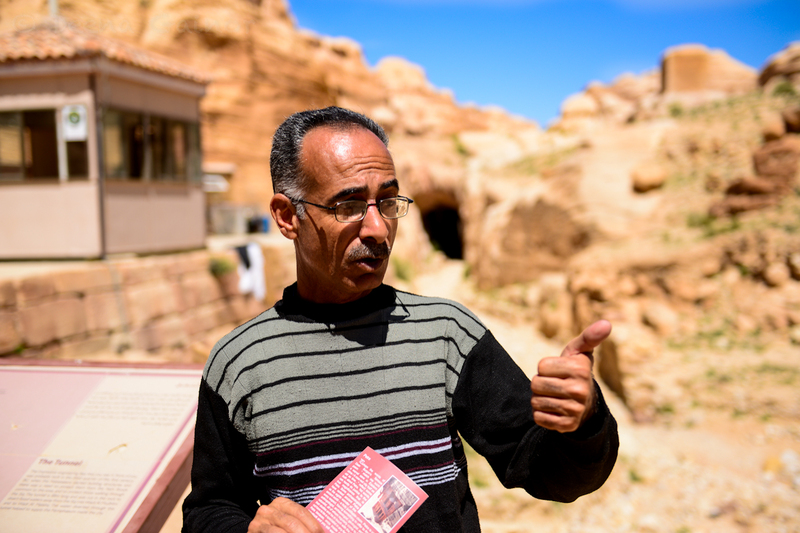 Invest in a guide, unless you already know a ton about Petra and its fascinating history. 7. You will be inundated with Bedouin salesmen. Smile, keep it friendly, but keep walking. Try to avoid looking at things you’re not really interested in buying. If you show even a tiny bit of interest, it’s over. (Quick note: The salesmen come in many shapes and sizes. 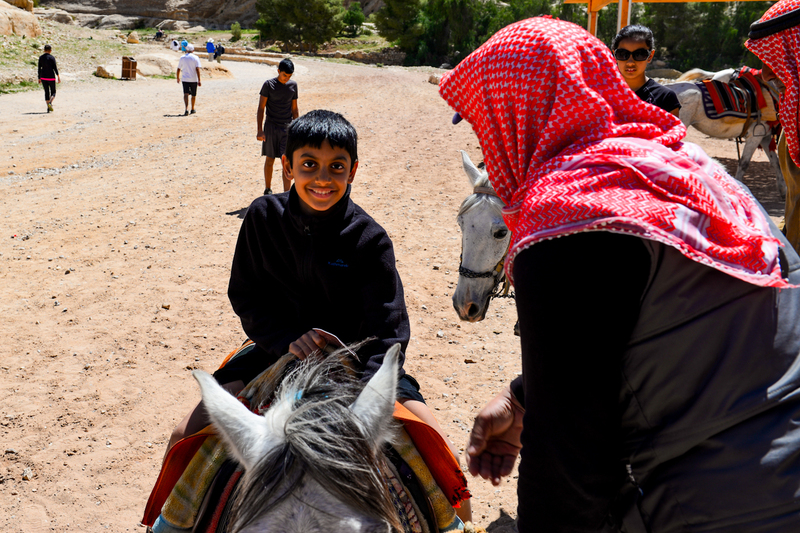 You’ll even find little boys hawking “Rocks from Petra” (see photo below). 8. Be careful when taking photos of people and/or animals. You may be asked to hand over a few coins for the privilege of taking a shot. And finally, one of those rare family shots, compliments of our tour guide. Thanks! It really is a unique experience, isn’t it? I hope you’re able to get back! Great, Barry! We’ll be sure to check it out. Well…we’re settled in London and excited to enjoy the beautiful weather we’ve been given. Looking forward to seeing you all soon!